Yesterday, the Patriots missed Deion Branch, and Tom Brady knew it. Already without six injured players, the Patriots finished yesterday's game without two more key contributors -- tight end Benjamin Watson and nose tackle Vince Wilfork. 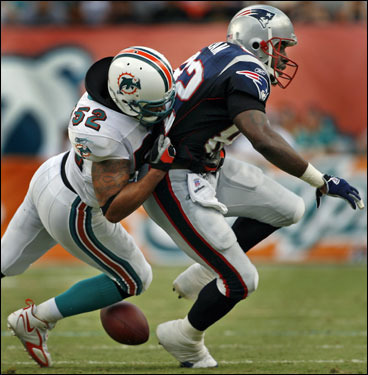 Watson injured his left leg when he was crunched between Dolphins defenders Renaldo Hill and Jason Allen on a long pass play over the middle in the third quarter. Two plays later, Wilfork hurt his right leg on a 4-yard run by Sammy Morris. No hard feelings. This wasn't Bill Belichick losing to a Bill Parcells team or an Eric Mangini team. This time, the postgame handshake was sincere. Coach Bill even went out of his way to say Nick Saban's name during his ever-so-brief concession speech. 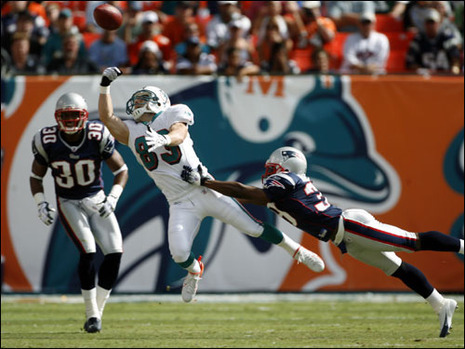 The view was so rare, Dolphins linebacker Zach Thomas figured he'd enjoy it. Patriots quarterback Tom Brady was pulled from the game, his team down by 21 points with less than five minutes remaining. "Oh, yeah, that was nice, it was a good sign," Thomas said. "They are going to be in the playoffs, and I understand pulling guys because you don't want them to get hurt. It would be the worst move if he got hurt when the game was out of reach."